In the everyday course occupation of homes and offices, junk and rubbish inevitably accumulate, whether it’s in storeroom, the attic, the basement, the garden shed or garage. People usually tend to turn a blind eye to old junk until there is hardly any living or working space, or unless it’s time to relocate, and the extent of the problem becomes apparent. Dealing with old junk and rubbish is a real nuisance, it takes time and lots of effort, plus on many occasions one has to organise the transportation and disposal of certain pieces of rubbish on their own, making everything all the more problematic. 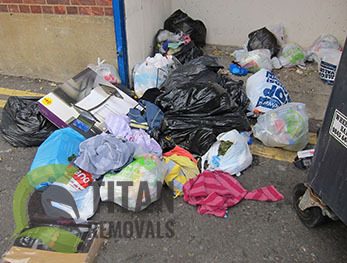 Our specialised junk collection services in London is the ideal alternative to dealing with domestic or commercial property rubbish on your own, save yourself the hassle and let us handle the job. Our domestic and commercial junk removal and disposal service is fully licensed. We have all required registration and permits for using various waste depots and processing centres. We guarantee responsible means of waste disposal – recyclables are separated from mainstream waste and handed over for further processing. Green waste is deposited at a number of composting stations we work with. Only non-salvageable waste we collect is transported to licensed tips. Safety and efficiency – our London junk collection and disposal service is carried out in accordance to applicable health, safety and environmental regulations. Our technicians are equipped with the necessary safety gear, and protective clothing. Waste will be collected and removed from anywhere on the property, including hard to reach spots like sheds, attics and basements. For optimal efficiency and minimum service time we would need sufficient vehicle access to the property, or the nearest possible on street parking. Bookings, collection and availability – the junk collection and disposal service we offer is convenient and service hours will not get in the way of your personal or business schedule. We can perform the collection and removal in a suitable time and day of the week, including public holidays. 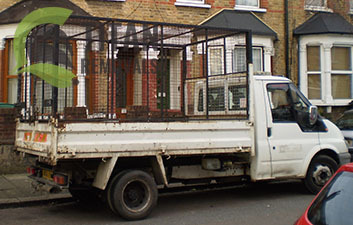 For commercial rubbish removals, we can do early mornings, evenings and Sundays. Fixed schedule rubbish removal and disposal is also available, frequency of visits depends on customer preferences. Pricing – the service is adequately priced, and won’t be a strain on your household or business budget. We will be more than happy to come out to your address for a viewing and onsite quotation in order to prepare an accurate estimate and offer you the best price. The junk disposal service we offer you would be perfect to accommodate your after-builders waste clearance in Greater London. After a tough home improvement/reconstruction job, there would a lot of rubbish that you would want to get out of your property. We will bring a skip to your property and help you fill it with the waste, and then drive it to the area designated for disposal. It is as simple as that – and very efficient too. The etymology behind the British capital’s name is somewhat unclear and there are a number of theories (some more ancient than others) as to how the name originated and came to be. One theory states that the city was named after its ancient (pre-Roman) founder, though there are no evidence of any kind that such person actually existed. Another theory suggests that the Roman (Latin) name of the city was taken from an already existing word in the local language. Some scientists have used morphology to explain the name’s origins. One thing is certain, Greater London today contains some of the most famous landmarks and tourist attractions in the country. The London Zoo, the magnificent Kew Gardens, Wembley Stadium and much more. Greater London is home to a number of fine residential communities. Heathrow International Airport, probably the most important transport hub in the capital, is within the western premises of Greater London.